You may connect your smartphone to iSunnao FM Transmitter through Bluetooth, or 3.5mm audio cable. 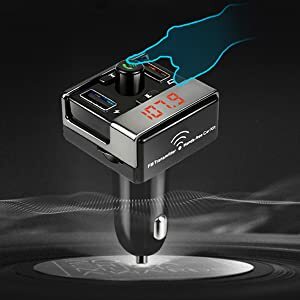 Simply select an empty chnanel on FM Transmitter and tune your radio to the same channel, to play your music from your smartphone to your car audio systm. It features dual USB Charging port with output voltage of 5V DC 2A to charge your iphone/Ipad/tablet/and other smartphone when you enjoy your driving. In addition, the first USB port with the built-in mp3/wma decoder to play the music in the U Disk. iSunnao EC2 Dual USB Car Charger features 3.1A 5V output. It charges most 5V USB Charged Devices, including Apple iPhone 6 6Plus 5S 4S iPads, Samsung Galaxy, HTC, Blackberry, both IOS and Android smartphones, and Tablets, MP3 Players, digital cameras, PSP, and more. Over-Charge and Over-Current Protection - iSunnao USB Car Charger features auto power off when the input and output current is greater than safety current. It protects the charging devices from Over-Charge and over- Current. 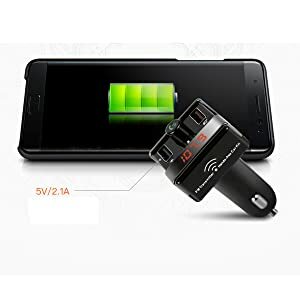 4 In 1 USB Car Charging Adapter - This Car Charger features LED display to show the voltage of the car battery, Internal temperature, and the current of the device you are charging. The display switches between these information every 20 seconds. It features dual USB Charging port with output voltage of 5V DC 3.1A to charge your iphone and other smartphone when you enjoy your driving. In addition, it has the lighter charging port to give you the ability to plug another car charger to your car.